The Saab 99 transmission is mounted underneath the engine and the clutch is up front. Extra air intakes under the main grill distinguished 1971 models, which also offered the addition of a 1,85 liter engine, and thus required the extra cooling air to keep transmission oil temperature down. Road salt and studded tires both help on slippery roads, but they can wreak havoc with the driver's visibility. 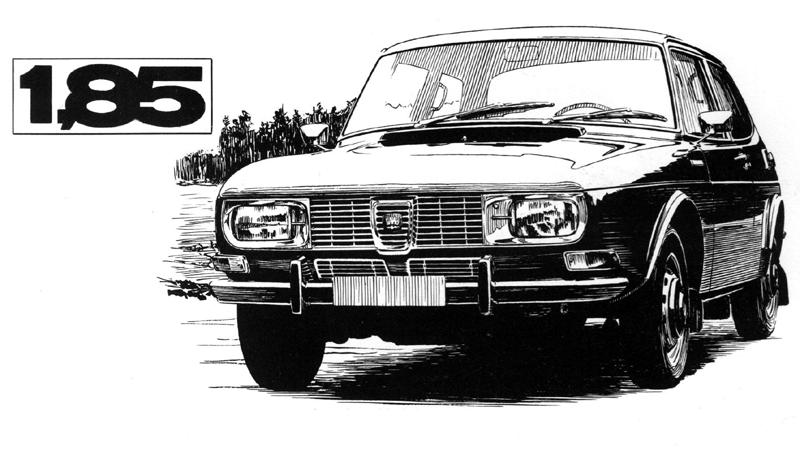 The problem of road dirt on the headlights had become acute in Sweden when Saab after some years of experimentation offered a solution: Wipers and washers for the headlights - coupled to the windshield wipers. 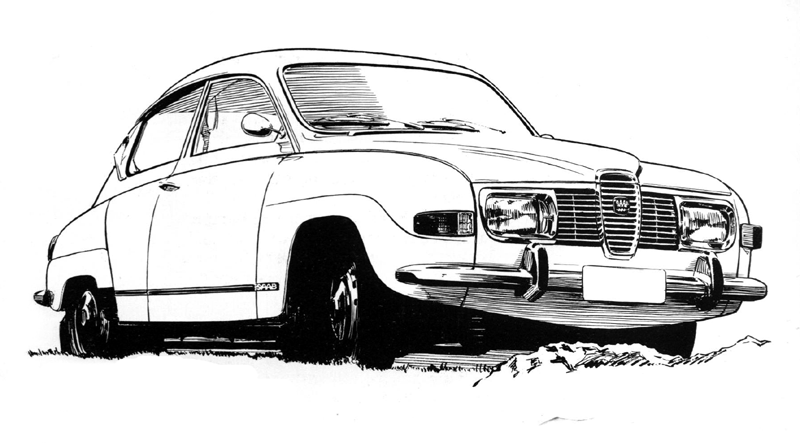 Headlight wipers became standard on all Swedish Saab models in the fall 1970. With the introduction of the 1971 Saab 99 models, the number of different versions doubled again. A larger engine had been added. Those buyers who wanted to shift for themselves could choose between 1.7 liter and 1.85 liter carburetor engines with 80 and 87 hp respectively, while those who preferred automatic shifting had to be satisfied with the larger engine, but could also order it with electronic fuel injection and 95 horses. An exterior sign on the new models were the air intakes between the main grill and the bumpers. Engine cooling had been considerably improved. So had rearward vision, thanks to the new rear-view mirrors; on the outside they were larger, better and anti-glare treated; and on the inside had an anti-glare position. Saab was commended by many for the design and construction of the new instrument panel that came on the 1971 Saab 99, and which helped make driving both more comfortable and safer. Another safety innovation that was offered by Saab as the first car marker in the world, earned Saab-Scania the 1971 Gold Medal of the Swedish Automobile Association. The award was for the Saab initiative in equipping all of its cars with a washer and wiper system for the headlights. New side moldings, headlight wipers, and headlight bezels were external distinguishing marks on the 1971 Saab 95/96 models. One thing common for both the 99 and 95/96 production line was the color program. New colors for the 1971 model year were Silver Mink, (light grey), and Tyrol Green (dark green), while Polar White, Toreador Red, Middle Blue and Savanna Beige remained from the previous year. Sea Green had been discontinued and black was only available on special order. Interiors were red, brown, blue or black. In order to make the base paint stick to all surfaces, with the right thickness, even on edges and in body cavities, Saab factories introduced the electrodip method of primer painting in 1971. The 95 and 96 models offered a number of changes for 1971. What most visibly changed the appearance, besides the new colors, was the low side moldings. Gone were the moldings over the wheel openings, or the double side moldings previously used on most export versions. From the front you could see the new headlight frames, fitted for headlight wipers (U.S. versions still retained round headlights and frames.). 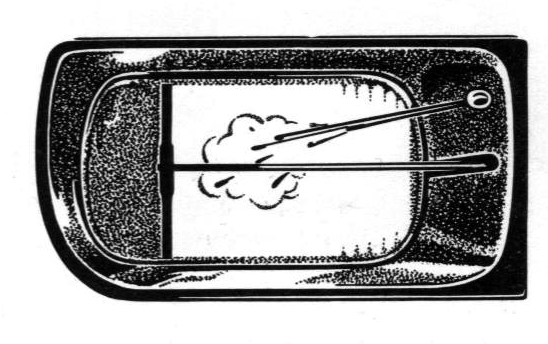 Looking inside, you could note that the handbrake handle had been redesigned, light switches had been changed and that a warm air duct had been installed for rear seat passengers (in left hand drive cars only). The 95 had padded window frames and a new seating alternative that allowed you to use the rearmost rear facing seat for seating even when the center seat was folded down to allow room for cargo. Also new, were the larger capacity battery and tires with profile depth indicator marks. All 95, 96 and 97 models for the U.S. were, as of the fall of 1970, equipped with a 1.7 liter V4 engine. The output remained the same as before: 65 hp. A few figures for 1971: Total production, 72,960 units. Of these 11,844 came from the factory in Finland where they assembled 445 Saab 95 models; 3,618 96s; and 7,781 99s. From Arlov came 1,952 Sonetts. The Trollhattan production breakdown shows 7,158 95s; 24,651 96s; and 27,355 99s. The export share was 54.3 percent.